Henry welcomes you to his abode! 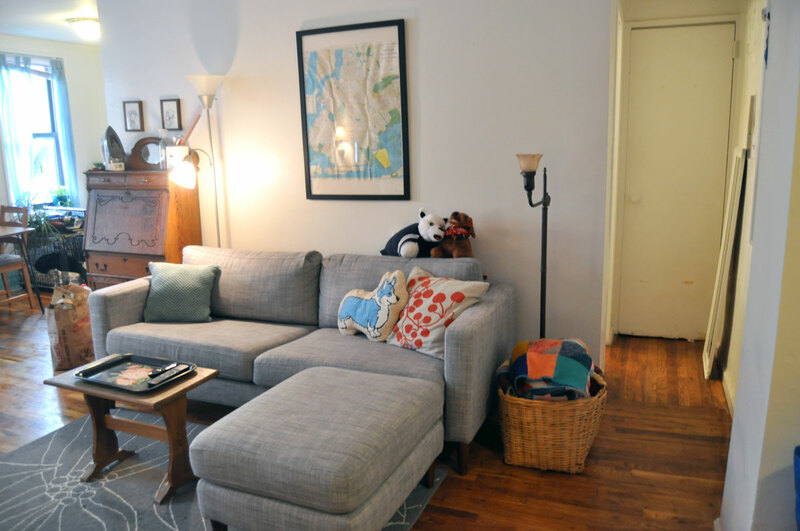 First, let me give you a virtual tour of my apartment, a studio that’s about 440 square feet. I was extremely lucky to find it at a price that I could squeeze into my budget. Extremely lucky. Voila! Life in a single room. Dedicated areas for dog items are essential if you want to share a small apartment with a dog and maintain the appearance that a human lives there as well. Henry has accumulated treats, toys, sweaters, harnesses, and more, and I have a couple of locations where I keep these items organized and contained. I purchased this organizational tower for $5 from a garage sale the summer before I went to college and it has followed me from dorm to dorm and from apartment to apartment. It now lives in a corner near my front door and I keep Henry’s towels, sweaters, accessories, and gear in it. Growing up, my family dog Tux always had a toy basket in the living room. He would go to it and choose a new toy whenever the urge struck him, and my mom would gather them every few days and return them to the basket. I carried this tactic to my adult life, and Henry has his own toy basket under one of my side tables. He doesn’t take many toys from it, but he did once bury a Kong in it and left me wondering where it was for months. Did I mention it had some wet food stuffed in it from his breakfast? Yup, that was fun. I found this particular basket at a garage sale for $5 when I was in high school – that price included dozens of vintage sewing patterns as well! I think you can tell by now that I love garage sales. Lastly, I keep Henry’s food and treats in containers on top of the fridge. A month or so into Henry’s adoption, I discovered that my building’s mice apparently have a taste for Merrick Dental Bones. 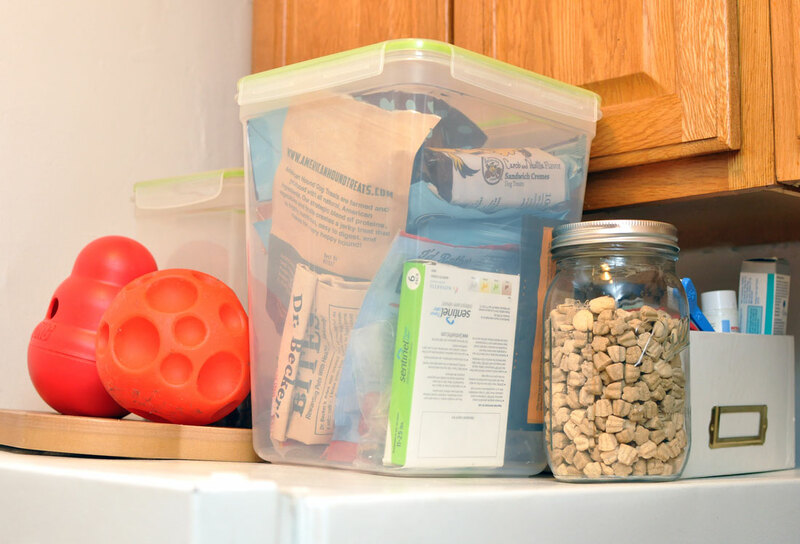 Since then, I keep all food and treats in these rodent-proof containers that also organize. I purchased these containers at a discount store near my office, but you can find similar ones at Amazon or any home good store. Henry is a BARKER. A Capital B-A-R-K-E-R barker. I deal with this in a few ways when I’m home – training, time-outs, a citronella-spraying collar at times – but I can’t work with him when I’m not home. Our hallway is especially amplifying, and our front door does little to block sound. Because I don’t have a separate room to close him in when I’m not home, I use an exercise pen to confine him and his bed to a section of the apartment that is as far away from the front door as possible. 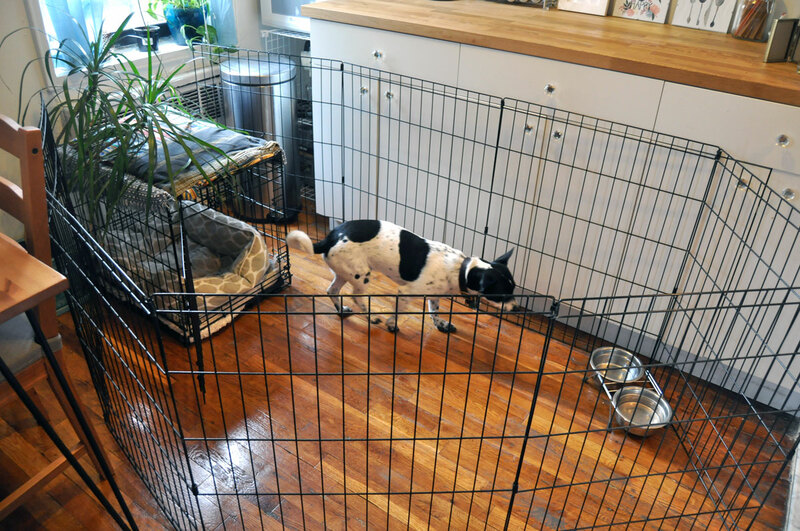 Exercise pens can be pricey, so check Craigslist (I bought mine for $30 from a fellow in Hell’s Kitchen). I helped Henry through several months of heartworm treatment when I first adopted him. Part of the treatment involved keeping him as calm as possible. I found myself with a neurotic, hyper two-year-old terrier mix and instructions not to exercise him. What the heck was I supposed to do? The solution: puzzle toys, which tire dogs out mentally instead of physically. 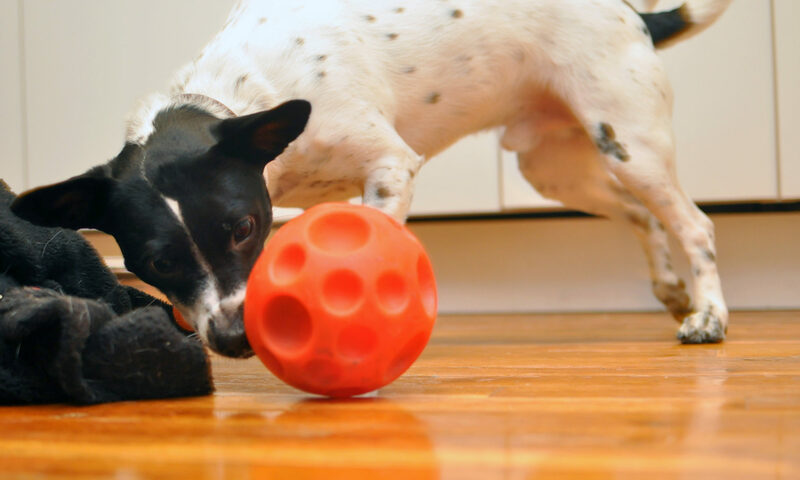 These toys are also helpful for a person sharing a small apartment with a dog who may not have a backyard to play in. 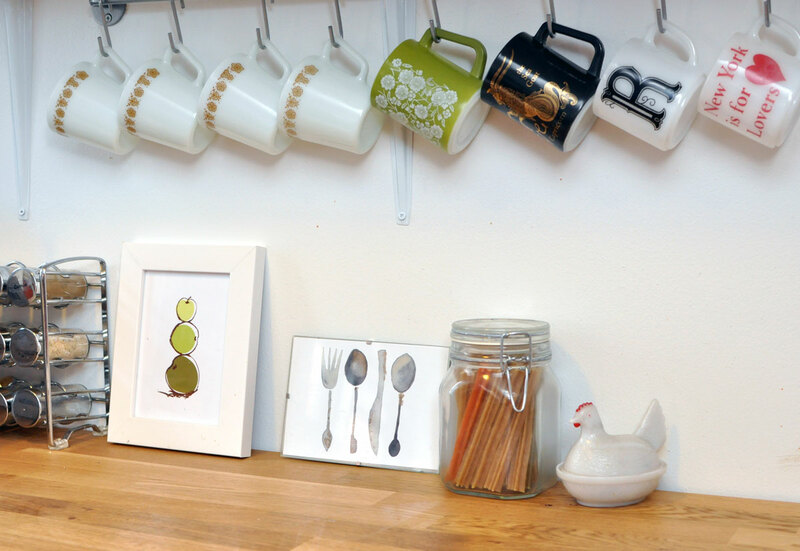 I collect vintage kitchen items and love that I can cook with as well as display them. I take a similar approach with Henry items. Do you see that glass chicken on my counter? Open it and you’ll find dog treats! It looks adorable on my counter while keeping some of Henry’s treats in an easy-to-grab location. It’s dual-propose! I also keep his Whimzee chews in the jar next to the chicken, which is much more attractive and space-efficient than the original packaging. Not super cheap, but air filters are worth it. Henry sheds. A lot. That means there is a lot of dander and fluff floating around my tiny apartment at any given time. Add in the fact that my neighbors sometimes smoke and I knew I should splurge on a good air filter. 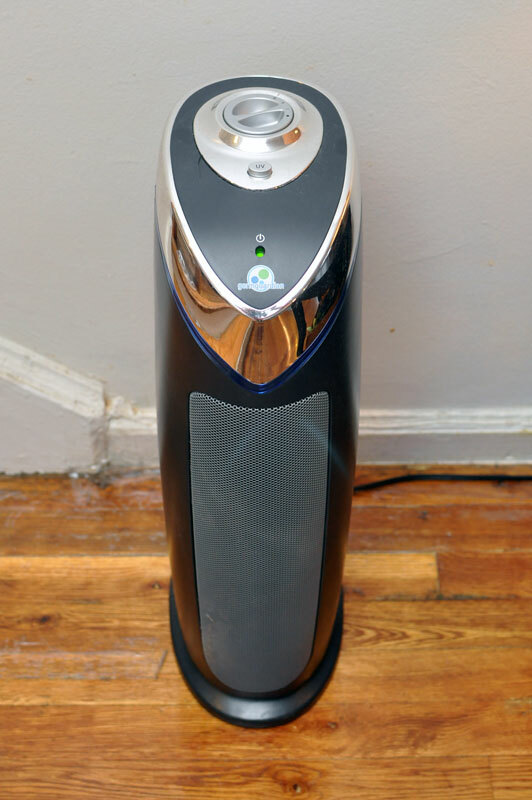 I purchased THIS ONE from Amazon, and have noticed that it has a big effect on my air quality. Plus, the subtle hum blocks out a little bit of hallways noise and prevents barking! While it can be an expensive purchase, I think an air filter is a good buy for anyone who shares a small apartment with a dog. I was absolutely thrilled to find an apartment with hardwood floors. The one downside is that they definitely contribute to sound transmission. I’m sure a running dog sounds like a herd of heavy-hoofed cattle to my downstairs neighbors, so I encourage Henry to play on my bed when possible. We do sometimes play fetch across the entire apartment, but encouraging playtime on the bed cuts back on potential annoyance. The couch: a (sort of) dog-free zone! Henry shows off our sheet bedcover. Right before I adopted Henry, I was planning to treat myself to a new duvet cover to celebrate my new apartment. Then I adopted Henry and I was SO GLAD I didn’t waste my money. If Henry comes in from a muddy walk or exits a bath, his first destination is always my bed. He rolls around on it and digs imaginary holes. A new duvet cover could have gone to you-know-what within a week. Instead, I use an old sheet to cover the bed. It’s easy to wash and takes abuse relatively well. Plus, it’s easy and cheap to switch out if I get tired of the color or pattern. A screenshot from the first day I used the camera – Henry is off to the right in his crate. There are so many dog and baby cameras on the markets and, as tempted as I am at times, I know there are cheaper options. 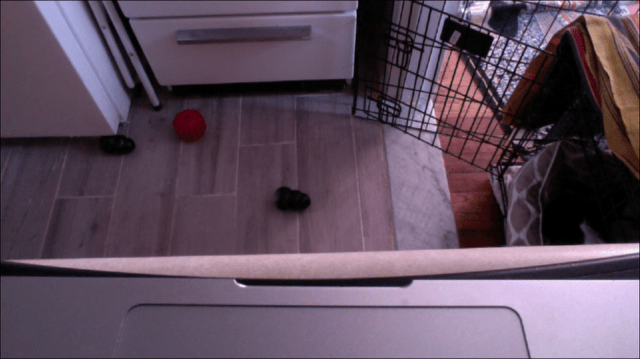 If you have a Mac or iPad and iPhone, don’t waste money on a fancy camera if you want to keep an eye on your dog during the day: simply purchase iCam Pro (I spent $10) from the App Store. You can use a Apple device at home for a camera (I used my computer, but I believe you can use an iPad or or old iPhone as well) and you will receive notifications when there is motion or sound. There are other iOS apps available and, while I am not intimately familiar with Android, I am sure there are similar options. 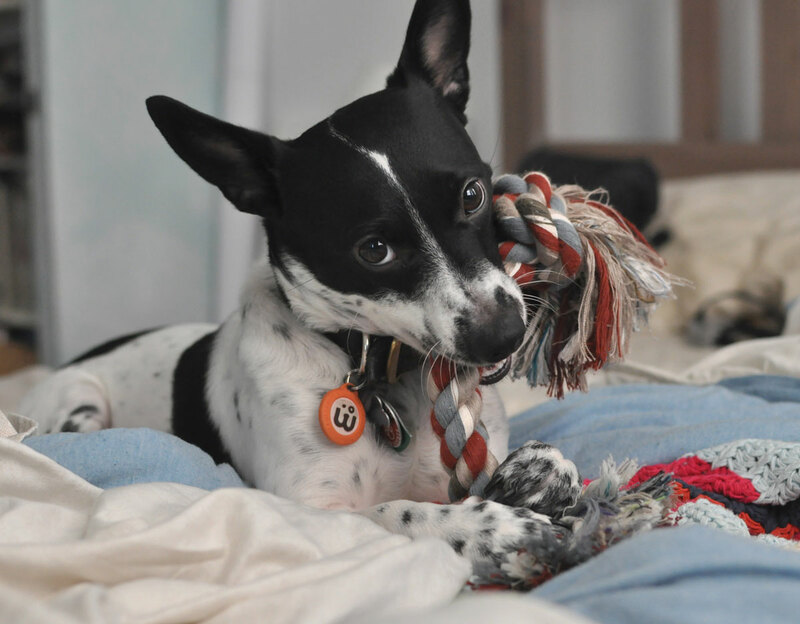 New York law states that if you keep a pet “openly and notoriously” for three months from when the landlord or an agent of the landlord is made aware – and the pet isn’t a nuisance or safety issue – any “no pets” aspect of your lease is voided. Cool, right? Learn more here (PDF alert) (and consult a lawyer, of course, because I am certainly not a legal expert). 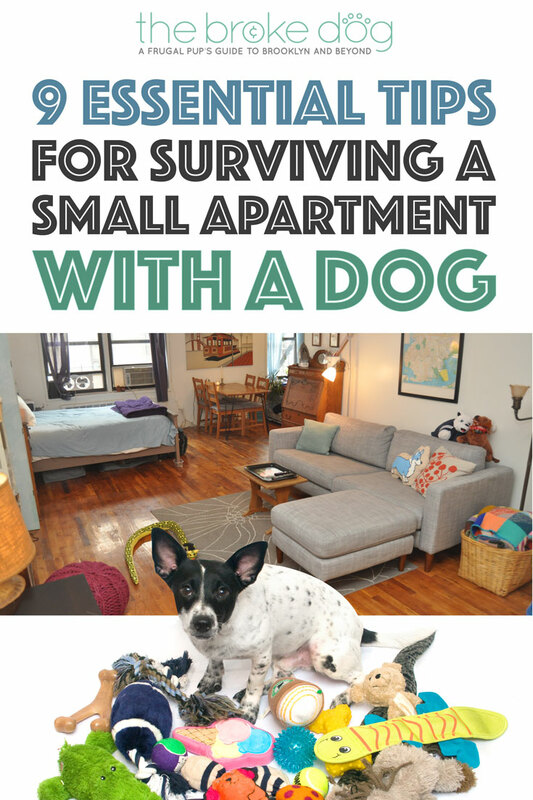 Living in a small apartment with a dog doesn’t have to be stressful or difficult! There are plenty of ways to make it an easy and fun experience for both of you. 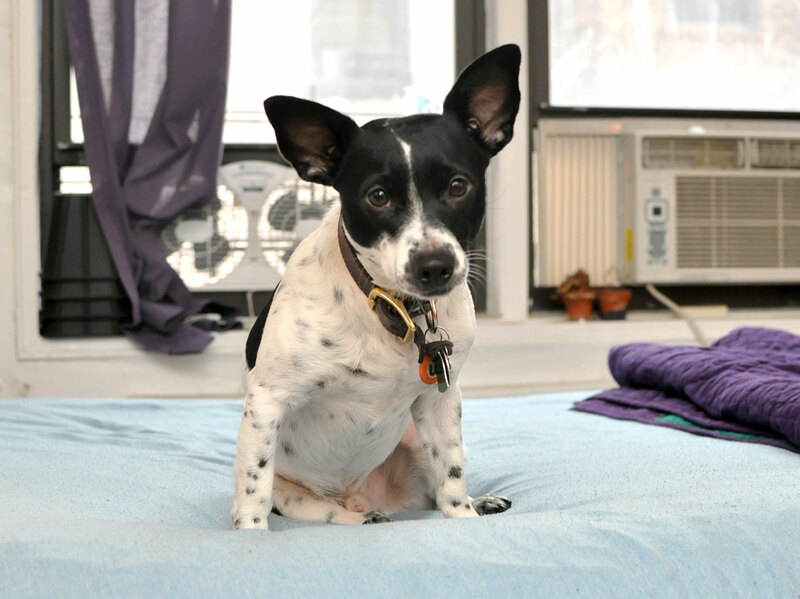 Do you live in a small apartment with a dog? Do you find it challenging? Do you have any other tips? Please share in the comments! I’m thrilled to see that someone else uses an air filter more for the dog than for themselves, ha! The white noise really helps with my dog’s nervous streak. I’ve found that he has a hard time sleeping at night without the filter on – he stirs at every noise from the street outside or our neighbors upstairs. The filter not only cleans the air but it also filters some of that noise. Great list! Thanks! And yes, white noise is SO necessary in my apartment haha. If the air filter isn’t on, a fan is. Definitely a huge help! Glad I’m not the only one as well! I LOVED this!! I have two beautiful pups and considering making a move to Brooklyn (how perfect is your blog for me???)! I have been very worried about space for my lab! I know it’ll be a little more challenging because she’s bigger, but these are wonderful tips!! I love this – it just reinforces the sad fact we aren’t allowed pets at ours but your apartment looks stunning, so cosy! Such good tips as well. Keep it up! Thank you! The photos were, of course, taken on a day the apartment was extra clean 😉 I’m sorry that you can’t have pets – it doesn’t stop some people in NYC, but it’s always good to avoid eviction! This article has been so helpful! I recently moved into a 400sqft house and have two large (over 65lbs each) dogs and was very worried about space for the three of us inside. My dogs have been staying at my parents while I finish the move so that the transition is a little less hectic for all three of us. 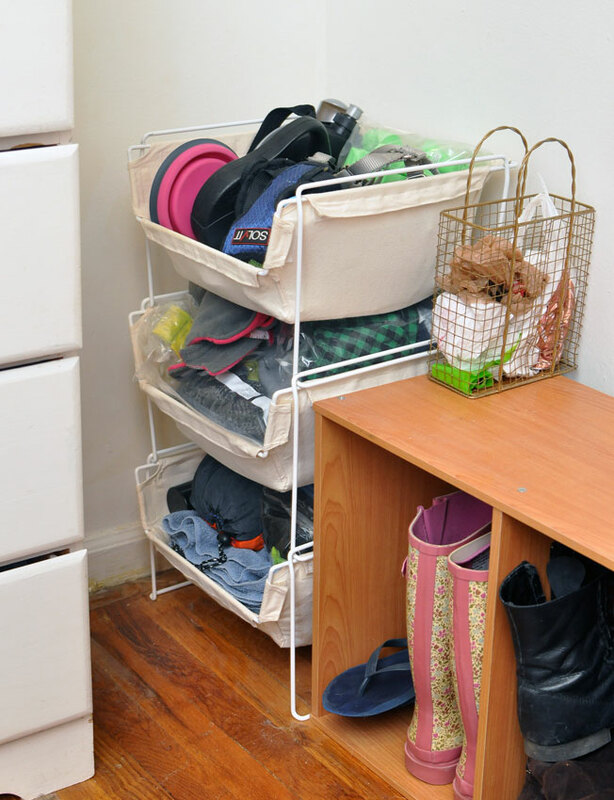 I love the storage tower you have and what a space saver! I’ll definitely be investing in something like that in the very near future. Thanks for all the tips! I’m so glad that you’re finding it helpful! Good luck with the rest of the transition! What a Great post! Excellent tips. When I lived in Manhattan I wasn’t allowed to have a pet, my roommates never seemed to be animalnlovers. Henry is SO adorable!! And your apartment loooks so nice, you’ve done a great job with it. Aw, thank you! I lived in two different apartments prior to this one, and my roommates already had dogs and didn’t want an additional one – so I made it my goal to find an apartment and get my own! We live on a moored houseboat in Australia with our 6mth pug thanks for the great tips will definitely will try some of these. I know this comment is rather late to the party but I found this blog post on pinterest and it honestly was so well done. So tired of seeing the same generic hints and tips of owning a dog in a small apartment. You speak the truth and give the greatest advice! 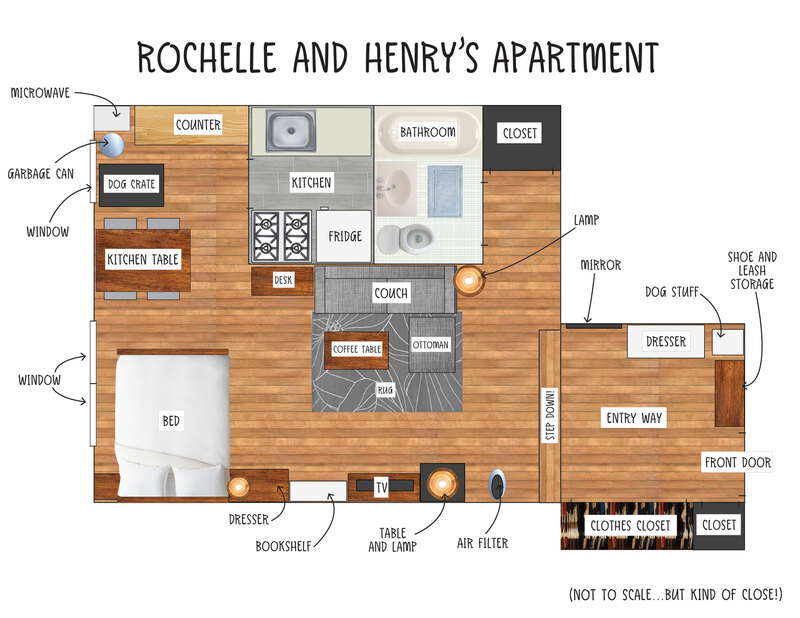 Your apartment is lovely and Henry is the cutest! Aw, thanks so much, Emma! This comment totally warmed my heart. I’m so glad to help! I love this article! I’m about to move into a small apartment with 2 dogs and liked a lot of your suggestions. I particularly liked to bit about the air filter because I never even thought of that. Also I would add that if you’re just moving into a new place, keep your dog in a crate until they are used to the place. When I made a big move with my first dog he chewed the door frame up badly on his first day out alone. Haven’t had a problem since and he is free to roam the whole apartment all day now, but I have definitely learned my lesson. Thank you, I’m glad you loved it! Good luck with the move! Hi! I just discovered your article and blog (thanks to Pinterest), and I love it. I feel particularly close to this since I’m moving out of my mum’s house in a few months, and w don’t know if my dog should come with me to my condo… With me in a small space, or with my mum, but alone all day? Hi Olivia! That’s tricky! If I could, I wouldn’t leave Henry alone during the day. I leave him penned to half of my apartment. It started out with a smaller area, with nothing he could destroy in it, but he’s earned my trust and now has half of the apartment so he can lay on my bed and snuggle in the sheets. I would let him have the whole apartment, but I get nervous that he would sit at the door and bark at the hallway. I recommend investing in a mental exercise pen that your pup can’t jump over. We got ours on Craigslist for $35 🙂 plus, I would invest in some Kongs that you can stuff with peanut butter or canned dog food and freeze. It keeps Henry busy for a while! There are other great puzzle toys like the Kong Genius toys that are fun too. 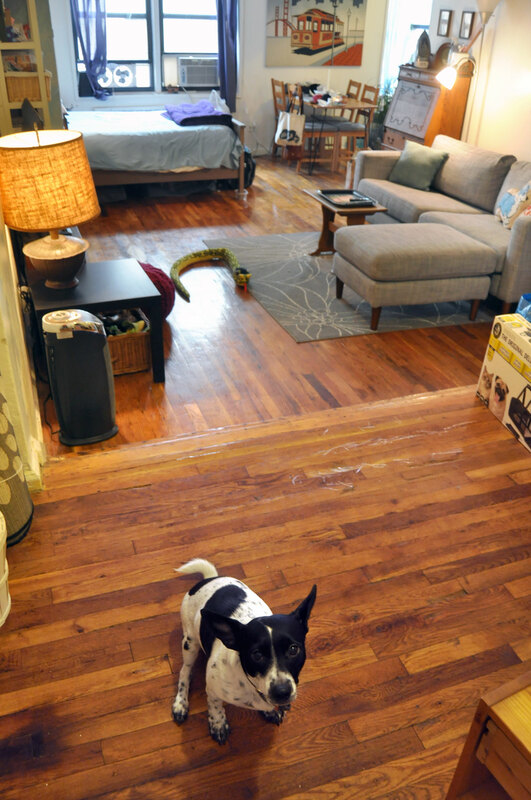 Thanks for writing this article and sharing pics of your home. This is very helpful. My little gush and I are moving from a house with a yard to a 2nd floor apartment. I’m glad I can help! 🙂 It can be challenging at times but is totally doable. Good luck with the move!